This is a mesmerising mystery story about friendship from the internationally bestselling author of Norwegian Wood and 1Q84. Tsukuru Tazaki had four best friends at school. By chance all of their names contained a colour. The two boys were called Akamatsu, meaning ‘red pine’, and Oumi, ‘blue sea’, while the girls' names were Shirane, ‘white root’, and Kurono, ‘black field’. Tazaki was the only last name with no colour in it. One day Tsukuru Tazaki’s friends announced that they didn’t want to see him, or talk to him, ever again. Since that day Tsukuru has been floating through life, unable to form intimate connections with anyone. But then he meets Sara, who tells him that the time has come to find out what happened all those years ago. Haruki Murakami’s new novel is unlike most of his previous works, which are strongly based in the metaphysical – strange events intersecting the everyday life of very ordinary characters are the norm. If you were put off by Murakami’s massive, meandering 1Q84 (2009) this latest book is similar in style and treatment to Norwegian Wood (1987), his most realistic novel and one of the most popular to date. 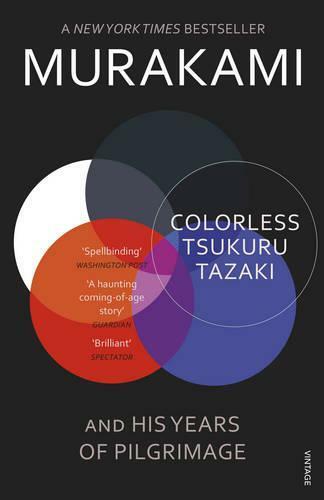 That said, Murakami’s new book might give Norwegian Wood a run for its money, with over one million copies of Colorless Tsukuru Tazaki and His Years of Pilgrimage already sold in the first week of release in Japan. The novel follows Tsukuru Tazaki, whose life was changed irreparably when his relationships with a close-knit group of high-school friends fell apart after he moved to Tokyo for university. Now 35 years old, Tsukuru is urged by a new girlfriend to address his past so he can uncover why his best friends abandoned him and tie up the emotional loose ends that have entangled him for so long. The classic Murakami themes of isolation and loss, missed opportunities, emotional struggle and intense desire are all here, and the narrative is well-crafted. One quibble is that Murakami’s depiction of the modern world is a bit clunky; the book is set in the present day, but his characters don’t seem really to have the hang of contemporary technologies. This novel is Murakami’s most tightly focused yet. Fans and new readers alike will be rewarded by this universal story – it speaks of our connection with others and the decisions and sacrifices we make. Ingrid Josephine is a friend of Readings.